LORDSTOWN, Ohio — Cheryl Jonesco had a plum job installing backup cameras in the Chevrolet Cruze compact car at the storied General Motors plant here. Her work on the assembly line for the last decade provided the financial means to buy a home while raising her now-teenage daughter. The shutdown has ripple effects that are stretching as far as the White House, but the most profound impact is in the struggling Mahoning Valley in northeast Ohio. At a nearby GM supplier, Comprehensive Logistics, workers learned just days before Christmas that their jobs also would end. One longtime employee, George Conne, said he worried about paying for his teenage daughter's college education. He already worked a second job as a basketball referee. "This isn't your rich city that's been blessed," said the 50-year-old Conne, who put together 450 struts a day for the Chevrolet Cruze's suspension system. This wasn't supposed to happen, especially here. And especially now, in the wake of President Donald Trump's 2017 Tax Cuts and Jobs Act, one of the largest tax-cut laws ever. The legislation cut the corporate tax rate to 21 percent from 35 percent, handing businesses a $1.35 trillion windfall over 10 years. The law gave tens of billions of dollars more in breaks on business investments and foreign profits, too. The Trump administration sold the huge rate cuts, the driving force behind the tax law, as the way to bring back American jobs and keep companies from moving overseas. This area has long been a backdrop for photo opportunities illustrating industrial heartland economic woes. It was less than two years ago that Trump showed up in nearby Youngstown and decried the jobs lost overseas. He famously urged a large crowd: "Don't move. Don't sell your house. ... We're going to get those jobs coming back." Those were welcomed words at the rally, where manufacturing jobs had been disappearing for decades — and still are. Click here to read the Center for Public Integrity's version of this story. But that's not how it worked out for workers here in northeastern Ohio. In fact, the results, so far, have been the opposite of Trump's promises. GM has shed roughly 3,000 hourly and salaried jobs in the area since the tax cuts. "General Motors got this big tax break, and they are taking the jobs away here," Jonesco lamented during an interview at a local hangout, Nese's Country Café. The pending closure has become a political fight, not just a corporate cost-cutting and repositioning move. This week, Trump, sensing the bad political optics of a tax law not bringing back jobs like he promised, went after GM leadership and its local union leader. He said he talked with GM Chief Executive Mary Barra. "I asked her to sell it or do something quickly," tweeted Trump, who has made GM an ongoing target. But Trump's threats and promises about bringing back jobs to the area could be an empty one, as the tax law's impact on the economy, as limited as it has been, may be coming to an end, economists say. In the short run, the tax law coupled with federal spending acted as a stimulus, a "sugar rush," economists say, that helped boost annual economic growth to 2.9 percent last year from 2.3 percent in 2017. After the release of the economic data, Trump was jubilant: "We have accomplished an economic turnaround of historic proportions." "For now, though, the slowdown in growth will serve as a reminder of the principle that big tax cuts can buy growth in the short-term, but that the sugar-rush is brief," said Ian Shepherdson, of Pantheon Macroeconomics. Since the corporate tax cut, growth in business investment has bounced around quarter to quarter, from a robust high of 11.5 percent in the first quarter of 2018 to a weak low of 2.5 percent in the third quarter. Business investment, however, is expected to "slow markedly after 2018," according to CBO. The growth in business investment hasn't impressed some economists. There is "no evidence suggesting the tax cut has provided sustained increase in business investment," said Mark Zandi, chief economist with Moody's Analytics. Others have a slightly different take. While politicians may have oversold the tax cuts' immediate impact, longtime industrial financial analyst Scott Davis said major manufacturing companies are weighing investments now that will kick in over the next three to four years. "Companies don't make new factory decisions in six months period of time," said Davis, co-founder of the independent research firm Melius Research. Davis credits the lower corporate tax rate with making U.S. companies' more competitive globally and slowing the flow of manufacturing jobs overseas. Still, Davis cautioned that increased automation across manufacturing reduces the need for labor. "We're not going to add nearly as many jobs as you would have historically," he said. February may have begun to indicate a slowdown. Manufacturing added only 4,000 jobs after a year in which manufacturing averaged 20,000 new jobs a month, the highest in nearly two decades. But manufacturing remains far below its peak in the 1970s when more than 19 million were employed in factories, driving America's economy. For Ohio, which had the country's third-largest manufacturing workforce, growth in these blue-collar jobs has been conspicuously absent. The state is struggling with one of the worst unemployment rates in the country — 4.7 percent in January, ranking it seventh from the bottom for all 50 states. The situation is more dire in the Mahoning Valley surrounding GM's Lordstown plant; December seasonally adjusted unemployment increased to 6 percent from the prior year. The rate is expected to climb even higher with the plant closure and layoffs at GM suppliers, The area will lose $3 billion in economic activity this year, according to a new study by Cleveland State University's Center for Economic Development. On March 6, after 53 years of making GM vehicles, workers assembled what could be the last one: a white compact Cruze. (GM has left open the possibility that it could use the 6.2-million-square-foot plant to build another vehicle.) They draped an American flag over the front hood and took a few photos to commemorate the event. The plant's idling will end 1,628 jobs there, according to GM's filings with Ohio, after two previous rounds of cuts. The first occurred two days after Trump's inauguration in January 2017 — when GM gave upbeat sales figures on the Chevrolet Cruze. A month later, in February 2017, Consumer Reports named the Cruze "compact car of the year." In June 2018, as Cruze sales started to fall, GM shed a second shift, affecting roughly 1,500 workers. Then another blow came: That same month, six months into Trump's tax law, GM confirmed plans to build a new Chevy Blazer in Ramos Arizpe, Mexico, where it also built a Cruze hatchback. A GM spokesman said GM bases production decisions, like the Blazer, on plants' projected availability. "It was a double kick to the gut," said Tim O'Hara, who retired at age 59 during last summer's layoffs after 41 years at the plant. GM appears undeterred by bipartisan political pressure from Trump and Ohio's elected leaders who have criticized GM's latest layoffs after the tax cuts. The corporation is enjoying a bevy of tax benefits, including $8.6 billion in U.S. tax credits partly carried over from losses prior to its 2009 bankruptcy, when it was bailed out by U.S. taxpayers during the financial crisis. It also has state tax credits, and under the first year of the new tax law GM reported an extra $104 million U.S. rebate in 2018. Since 2010, the first full year since coming out of bankruptcy, GM has reported $33 billion in income before taxes — including some years that they didn't pay any taxes. GM booked $18.4 billion in net tax benefits, according to its annual filings with the Securities and Exchange Commission. GM's future plans fly in the face of Trump's promises that the tax law will create more investment and bring jobs back to the United States. The company said it seeks to save $6 billion by 2020 through its November announced restructuring, which includes reducing investments by $1.5 billion and ongoing U.S. layoffs impacting as many as 7,950 salaried positions and 2,800 hourly workers. In the United States, GM increased its salaried payroll by 47 percent to 53,000 since 2013, while reducing its hourly employees to 50,000, according to company annual reports. GM has cut 5,000 U.S. hourly workers in the last two years but added 3,000 jobs in Mexico and Canada. A company spokeswoman, in an email, said GM has invested $22 billion in U.S. manufacturing since coming out of bankruptcy. The November announcement is "a continuation of a [March 2015] strategy to transform our business to meet changing consumer preferences and lead the future of mobility," the spokeswoman said. The reduction in business investment is a "return to a normal run rate" following increased investment over the last few years when GM "refreshed" crossovers and trucks, and developed new models for China and South America, the spokeswoman said. Matt Gardner, a senior fellow with the Institute for Taxation and Economic Policy, a nonpartisan, liberal think tank, said GM's announcement confirmed economists' arguments regarding the tax cuts. "Corporations will always base their investment and job-creation decisions on market fundamentals and consumer demand, not on incremental tax giveaways," Gardner wrote on his blog. "No amount of tax cuts could change this calculus for GM." With uncertain futures, employees are leaving their homes for openings at other plants nationwide. So far, 417 of about 1,200 currently affected hourly Lordstown employees are moving for jobs elsewhere, according to GM spokesman Dan Flores. "We are legitimately trying to minimize the impact on our workers," he said. 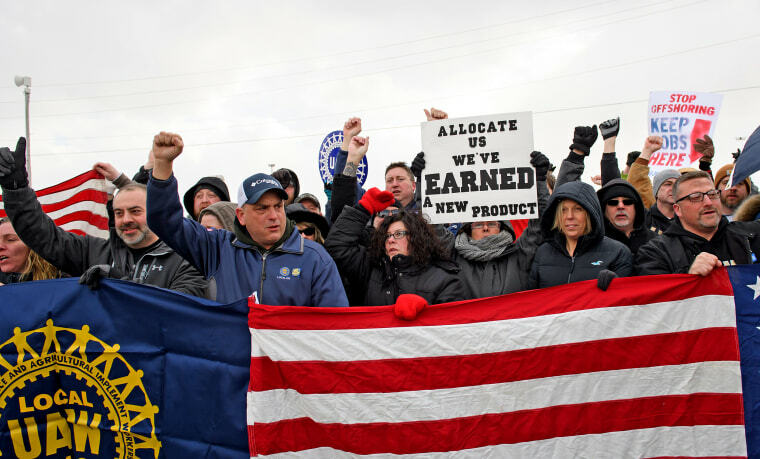 But the retired O'Hara, who's a local union leader, said GM's employee numbers do not account for the more than 3,000 positions previously eliminated at the plant in 2017 and 2018. O'Hara said many workers are not in a position to move for a job, and they can't afford to retire. The Lordstown plant is part of a bigger GM strategic puzzle that will play out in the coming months. A number of factors are at work, from UAW negotiations and potential automobile tariffs to politics and industry economics. The national UAW contract is up for negotiations in September, and one critical item that will be subject to negotiation is whether GM will retool one of the now "idling" plants to manufacture a new vehicle. The impact of the GM closures is just starting to sting. (Every GM job creates 8.6 indirect supplier jobs, making everything from car seats to glass, according to a 2015 Center for Automotive Research report.) Since the Thanksgiving news, local Lordstown suppliers have started to file layoff notices; Comprehensive's assembly line employees have begun applying for unemployment. "It started out so well, so promising," said former Comprehensive worker Conne. "We were the number one selling car."